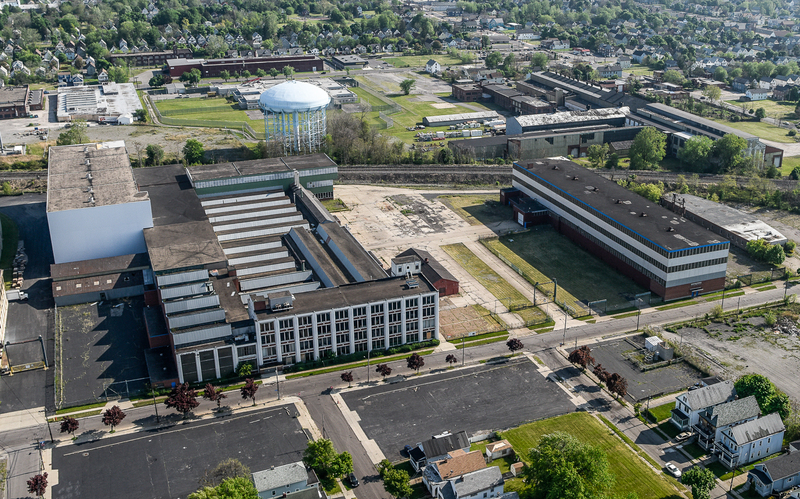 Aerial view of the Niagara Machine & Tool Works on Northland Avenue in Buffalo. Photo courtesy Joe Cascio. The oldest section of the Niagara Machine & Tool Works Factory - 1910, designed by Green & Wicks Architects. Photo courtesy Joe Cascio. Stabilization and demolition of 777 Northland Avenue, the Otis Elevator Company Foundry. The front facade of the Niagara Machine & Tool Works Factory. Photo courtesy Joe Cascio. The Niagara Machine and Tool Works Factory consists of three distinct buildings related to specific functions of the manufacturing facility and the factory’s evolution: 1) The Headquarters and Main Factory (built in multiple building campaigns from 1910-1981), 2) The Pattern Shop (1913) and 3) the Metal Fabricating Plant (1953). 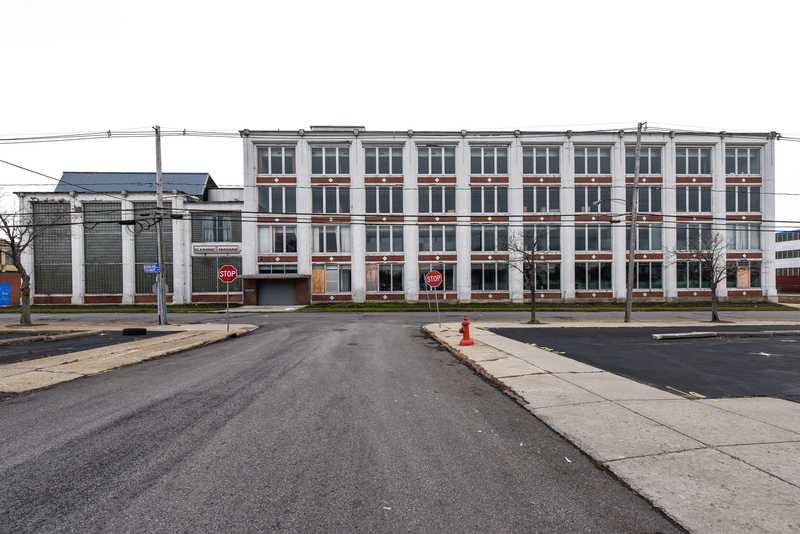 The Headquarters and Main Factory and its adjacent Pattern Shop at 683 Northland Avenue are being rehabilitated. 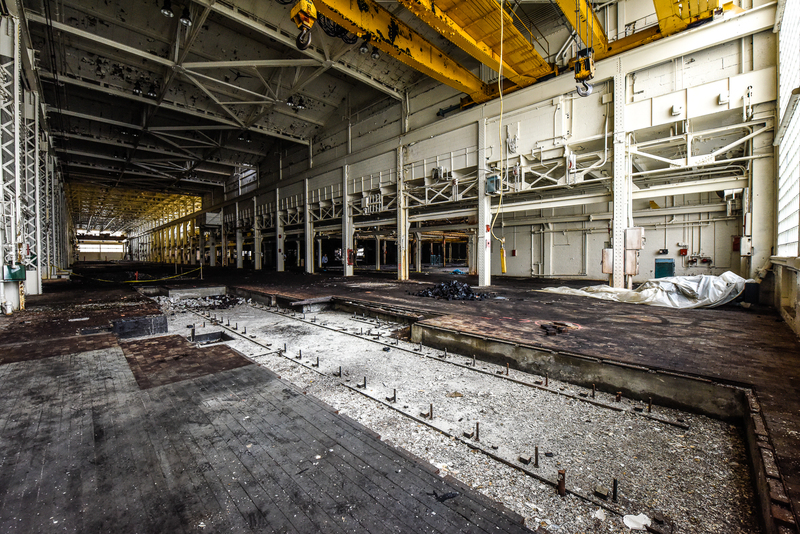 The Metal Fabricating Plant is on hold for future use. 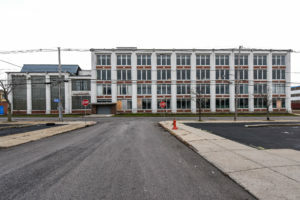 Rehabilitation Overall scope of work: The Headquarters and Main Factory and the Pattern Shop are being rehabilitated for a Workforce Training Center and related tenants. In order to acquire the use of historic tax credits (20% from the state and 20% federal) the project is going through the full Historic Preservation Certification Application Process which includes three parts and review and approval by both the New York State Office of Historic Preservation and the National Park Service. Niagara Machine and Tool Works Factory Complex National Register Historic District Designation The Historic District was officially listed on the National Register in March, just a couple weeks ago! The Niagara Machine and Tool Works Factory Complex, located on the East Side of Buffalo in Erie County, New York, is a large industrial facility designed and constructed between 1910 and 1981 by Niagara Machine and Tool Works. 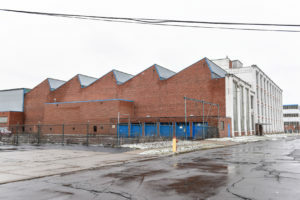 The complex is located on the south side of Northland Avenue, an east-west thoroughfare between Chelsea Place and Longview Avenue, along a highly industrialized core north of a CSX railway line, originally known as the Belt Line. Residential neighborhoods, both south and north of the railroad, surround the factories that line the corridor. The principal elevations of the factory face north onto Northland Avenue and south onto the Belt Line. 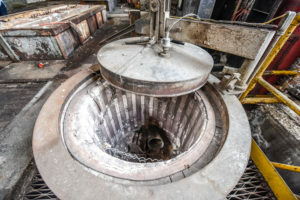 The complex is best known by the name under which it achieved local prominence: Niagara Machine and Tool Works Factory. 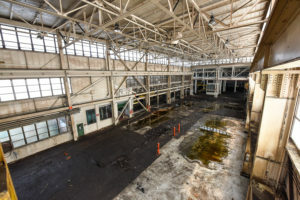 The area retains its original industrial feeling and setting, with four other factory buildings and complexes lining Northland and another several factories found along East Ferry Street to the south. Each factory had its own Belt Line Rail Road spur or spurs, remnants of which can still be seen. The Niagara Machine and Tool Works Factory consists of three distinct buildings related to specific functions of the manufacturing facility and the factory’s evolution: 1) The Headquarters and Main Factory (built in multiple building campaigns from 1910-1981), 2) The Pattern Shop (1913) and 3) the Metal Fabricating Plant (1953). Also counted in the resource count are three contributing structures: the extant rail spurs from the Belt Line railroad which are still present on the property. The 11 acres of land is primarily occupied by the Main Factory on the eastern half of the site, stretching from Northland Avenue to the railroad. The Pattern Shed is situated just west of the Main Factory towards the northern edge of the site. The Metal Fabricating Plant hugs the western edge of the site, also stretching from Northland to the rail line. A concrete drive wraps around the site with a ribbon of parking against the east side of the Main Factory. A concrete drive and parking lots separate the Main Factory and Metal Fabricating Plant, with iron gates demarcating the vehicle access. 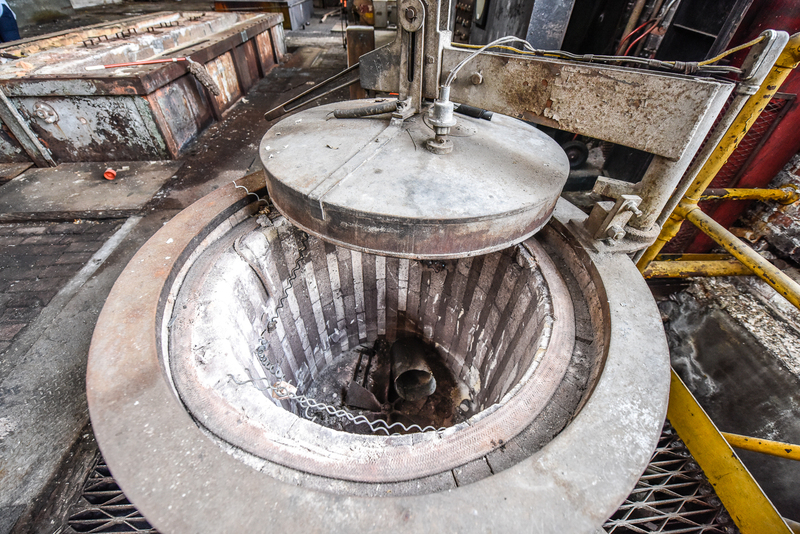 Industrial features remaining in the original foundry of Niagara Machine & Tool Works Factory. Photo courtesy Joe Cascio. Interior of the 1964 International Style addition of the Niagara Machine & Tool works Factory. Photo courtesy Joe Cascio. The Niagara Machine & Tool Works Factory is significant as a good intact representative example of a large-scale tool and machine factory designed and built during the first half of the twentieth century. 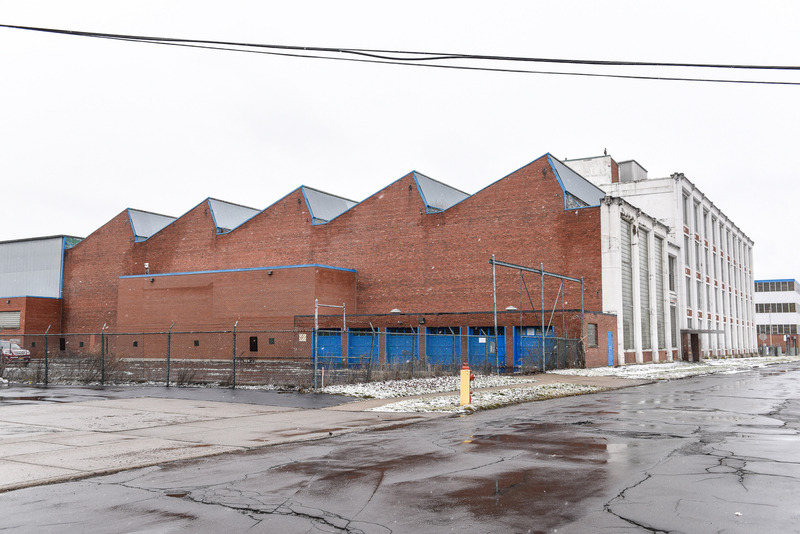 It is significant in the area of Industry as one of the oldest and most important tool and machine manufacturing facilities built and operated in Buffalo in the twentieth century, whose products were used nationally and internationally across industries. It is significant for its contribution to the manufacturing of tools and machines for working sheet metal, specifically specializing in presses, punches, and rotary sheets for government defense contracts. The company had orders from the federal government during World War I and World War II. But it is during World War II that the company established its role as an important defense contractor. The company had government orders for regular products in addition to equipment for many of the significant international aircraft manufacturers, who used the company’s presses to manufacture small parts for aircraft assembly, both during and after World War II. 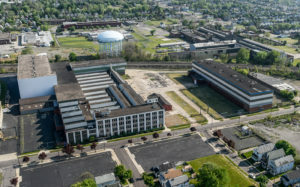 The factory complex is further significant for its association with the industrial development of the East Side of Buffalo along manufacturing nodes of the Belt Line railroad in the early twentieth century. The complex is also significant in the area of Architecture, as a good, representative example of evolving industrial architectural and engineering trends, innovations and developments during the twentieth century. The Niagara Machine & Tool Works Factory is a good example of early twentieth-century factory design with the original buildings designed by the noted Buffalo architectural firm of Green & Wicks, and later buildings and additions designed by local civil engineers H. E. Plumer and Jacob Fruchtbaum. The factory incorporates key advances in factory construction of the period for increased daylight with its large window openings and sawtooth monitor roofs. It also employs modern fireproof construction materials. Advances in early twentieth- century factory operations for mass production incorporated management science and the assembly line as evidenced in the layout of the plant and its two primary buildings. It is significant as a largely intact twentieth-century heavy manufacturing facility located in an industrial node of the East Side of the City of Buffalo. The original sawtooth monitors at Niagara Machine & Tool Works Factory. Photo courtesy Joe Cascio. The period of significance begins with the initial design and construction of the factory in 1910, when Green & Wicks designed the first buildings on Northland Avenue and extends through 1967 when the final architecturally significant addition was completed in the complex. While the factory continued in operation into the 1990s, this era encompasses all major construction projects by the company and reflects the period during which the company was at its most prominent. Subsequent additions made to the building in 1976 and 1981 after the period of significance are relatively minor additions in terms of architectural design and are located mostly toward the south end of the Main Factory. The last building campaign that can be considered architecturally significant was completed in 1967, which also coincides with the final piece of the factory’s post-World War II and Cold War expansion. The proposed historic district nomination boundaries encompass the three contributing buildings, the Belt Line spur and the surrounding 11-acre site historically constructed and used for this production. This project includes the 7.28 acres and Belt Line spurs related to the Main Factory (approximately 232,500 square feet) and the Pattern Shed at 683 Northland only. (I apologize for the wonky formatting; the website is under renovation.) And if you’d like to “subscribe” or follow my blog, True Green Cities, please sign up through the “Subscribe” button at the bottom left of this page. You’ll receive a daily recap when new blogs are posted. Or Sign up for the Feed, also at the bottom left of this page.